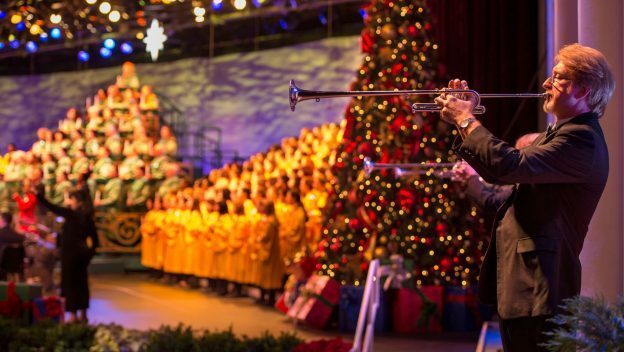 The preliminary list of narrators for the 2018 Candlelight Processional – along with details on the Dining Packages – has been announced. The Candlelight Processional tells traditional story of Christmas with a 50-piece orchestra, a massed choir, and a celebrity narrator. The show is performed three times per night (5:00, 6:45 and 8:15 p.m.) during the holiday season at the America Gardens Theatre. The Candlelight Processional Dining Package is available on select days at select Epcot restaurants for breakfast, lunch, or dinner. See a full list of participating restaurants here. Booking for the Candlelight Processional Dining Packages starts July 11 here. For the most up-to-date information on the Candlelight Processional and dining packages visit the Disney Food Blog’s Candlelight Processional page.